Packing fits into my category of cleaning. Which I also love, but only the fun type of cleaning, like emptying out old closets, sweeping up spilled Cheerios, and folding warm static-y post-dryer clothes. Three activities of which I’m particularly fond of. I must admit that cleaning my room is on the top of my favorite things to do, almost grazing writing in a plain black journal with a steamy cup of peppermint tea. Ironically enough however, my room is a constant disaster. Although I often feel like I spend the entirety of my spare moments wading through cleaning it. Still haven’t sorted through the complexities of that paradox. 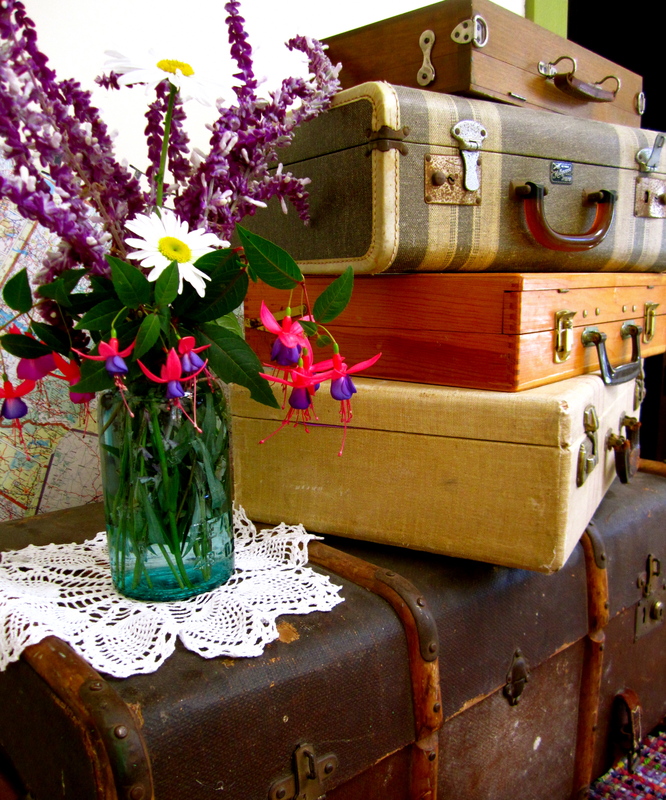 Packing for a trip, to my delight, is like cleaning for a purpose. It also includes, which I won’t eschew either, shopping for a purpose. A reason to rid your closet of the most comfortable elastic-less underwear, third grade class t-shirt, and that faded pink, ratty old sweater that magically becomes the first thing you put on. If it doesn’t fit in the suitcase, it’s got to go. I made an exception for a pair of moss green beaded espadrilles, and hid them in the back of my empty closet, hoping their impracticality would mark my return to the States of America. I do believe, however, I’ve somehow discovered the reason behind the majority of all suitcases being black, the most evident of which, includes the miraculous slimming qualities of the color black. That can make even the most abundant of overstuffed luggage look remotely thinner. Whereas, my own bright red polka dotted bags never manage to attain that same degree of sophistication. But they are pretty cute, to say the least. One thing that’s left me persistently baffled is the manner in which a girl such as myself, who loves organization to such a meticulous degree, has absolutely never managed to pull up to the gas station pump with the right side of the car facing the tank on the first try. Not to mention all those times I forgot to empty the lint filter in the dryer, or left my quesadilla on the stovetop frying to a blackened crisp. Or the way I consider it a rare blessing when I’m able to find the car keys in under five minutes. Perhaps organization comes in hills and valleys, in ebb and flow. Becoming too organized can leave a sterile taste at the back of your tongue, and a floor too clean to tiptoe on. Being too flamboyantly gaudy with muddled disorder, obtrudes your mental space with materiality, and obstructs clarity of thought and vision. I guess we just can’t win em all, and in the meantime, I’ll be over here leaving my coffee cup on the roof of the car in the Coffee Bean parking lot, as I peel out of the drive way, just to run home and measure the precise degree and angle each item occupies in my suitcase, and the additional weight it adds. Enter your email address to subscribe to this blog and receive truly fabulous notifications of new posts by email. Please await with baited breath. Happy Hogmanay to All, And To All A New Year! theimpatientraveler · Meet me in the garden at midnight.